Bill Gates thinks something is going to die too. No, it’s not physical books like Nicholas Negroponte — instead, Gates thinks the idea of young adults having to go to universities in order to get an education is going to go away relatively soon. Well, provided they’re self-motivated learners. “Five years from now on the web for free you’ll be able to find the best lectures in the world,” Gates said at the Techonomy conference in Lake Tahoe, CA today. “It will be better than any single university,” he continued. He believes that no matter how you came about your knowledge, you should get credit for it. Whether it’s an MIT degree or if you got everything you know from lectures on the web, there needs to be a way to highlight that. He made sure to say that educational institutions are still vital for children, K-12. He spoke glowingly about charter schools, where kids can spend up to 80% of their time deeply engaged with learning. But college needs to be less “place-based,” according to Gates. Well, except for the parties, he joked. But his overall point is that it’s just too expensive and too hard to get these upper-level educations. And soon place-based college educations will be five times less important than they are today. According to Gates, our text books are three times longer than the equivalents in Asia. And yet they’re beating us in many ways with education. The problem is that these things are built by committee, and more things are simply added on top of what’s already in there. 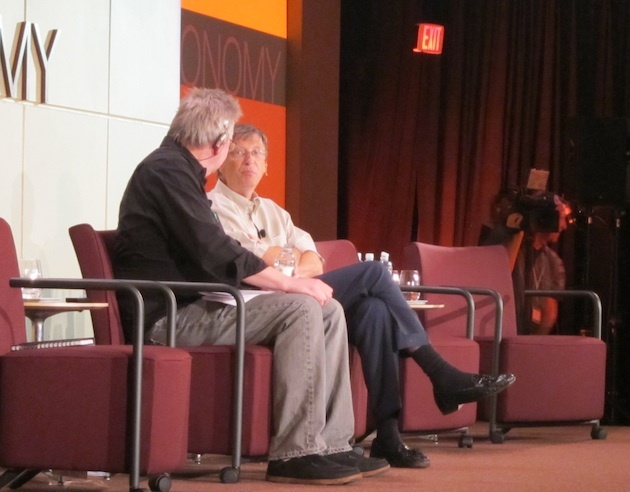 Gates said that technology is the only way to bring education back under control and expand it. See also: Bill Gates’ Mind Is In The Gutter. Literally.